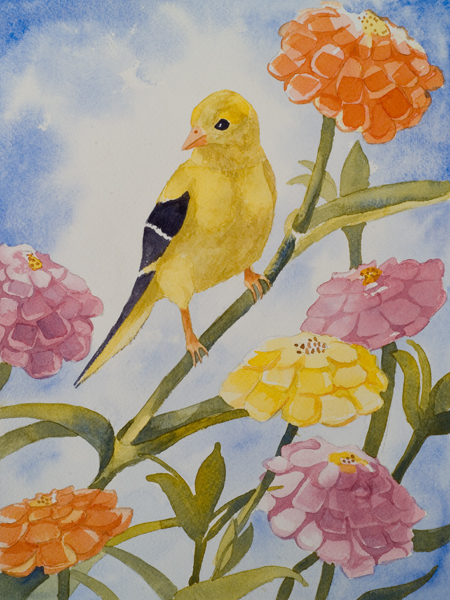 Although I created this four hour crash course for adults; guests at Callaway Gardens, who wanted to try watercolor and walk out with a painting, all in the same day, I have found that many of my students take the classes over and over, because they are fun, and because they learn something new every time they paint a different subject. There are nine subjects in the series and I’m planning on adding a tenth before the end of the year. This subject, Goldfinch, is scheduled for June 19th at the new Sportsplex, a beautiful facility, in Valley, Alabama, 12:30-4:30. Starting next week, I will be teaching a one day crash course at Callaway Gardens every Wednesday. The subject is “Sunflower”. Then, on June 26, at Art Works in Pine Mountain, the subject will be “Callaway Chapel”. On July 31st, I will teach “Magnolia” and on August 7, “Viceroy Butterfly”. I’ve already started working on my fall class schedule.